Another miraculous miss. After the damage to the ship had been mopped up and repaired, Sky took a pair of metal cutters to the big red ball (the Japanese aircraft insignia) on the wrecked wing and cut strips to distribute to his shipmates as souvenirs of the battle. Sky literally had a bird’s-eye view of the proceedings. 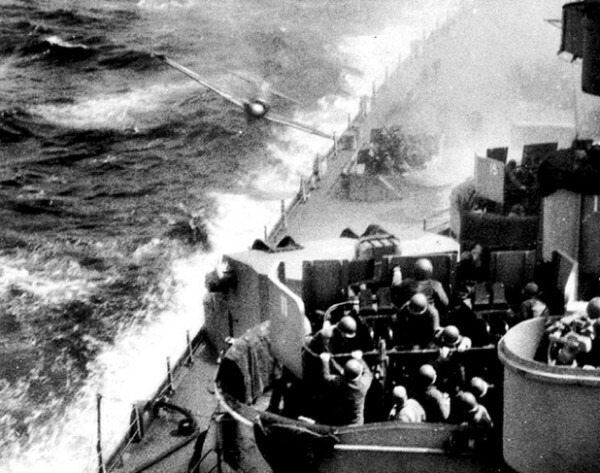 From a perch “12 stories up” he witnessed Nimitz, Halsey and McArthur receive the sword of the Japanese military representative as they all signed the surrender documents – a chickenskin moment.